UDM Downloads > MSSQL Conversion Software! MSSQL database file conversion program allows user to easily, efficiently and quickly convert database records from one database to another database format. Professional database migration application convert data base with all necessary attribute and default values including null values, unique, primary and foreign key constraints along with indexes. 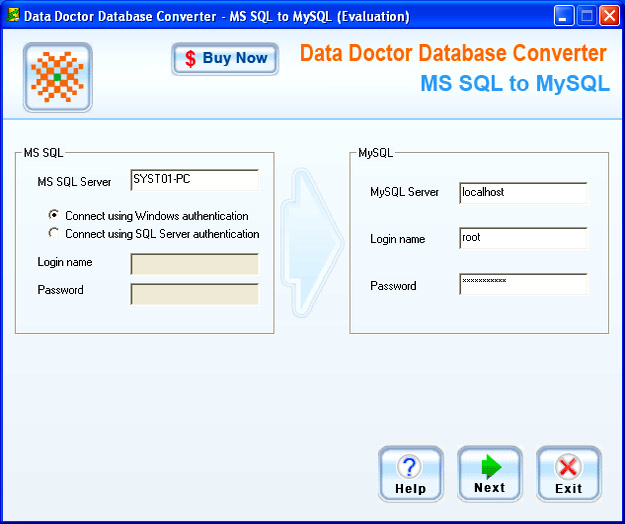 MSSQL to MySQL database converter utility is a perfect tool to transfer individual tables or more than one table records. Database file converter utility can export MSSQL data base into new database or merge the contents of existing database. MSSQL database conversion software is a specialized tool to transfer indexes and relation on Windows 98, 2000, 2003 server, XP, NT and Vista Ultimate or Business Edition operating systems. Database migrator application provides user friendly graphical interface and thus user dose not required to take any specialized or technical training to operate the software. Features: * Database synchronization software is capable of converting MSSQL created database records into MySQL database records. * Automatic database synchronization utility can convert whole data base record in very less time with optimum result. * Professional database migration utility is non-destructive, easy-to-use, read-only, fast and secure tool. * Distributed database migrator tool supports all major versions of MSSQL and MySQL database server. * Convert MSSQL to MySQL database is suitable for all type of organizations including small scale as well as large scale organizations.